Music is great for kids with autism. My child on the spectrum started rocking back and forth to music at about three months of age. Even then he demonstrated a great sense of rhythm. When he was a year old he'd pound on the table or other object in beat with the music. I always thought he'd make a great drummer although recently he has shown a preference for stringed instruments. When my son was about eighteen months old, I enrolled him in his first music class at Michigan State University Community Music School (back when we lived in Lansing) which has a focus on rhythm, patterns, etc. I had no idea he was on the spectrum, although it did not matter at the time because parents or caregivers were required to attend the class with the child. When we moved to Mt. Pleasant, Michigan I switched over to Kindermusik because I heard about the program's emphasis on play. Also, Kindermusik had received great reviews from every parent I spoke to about it. My son was four or five years old at the time. The age appropriate class, (Imagine That! for ages 3-5), for him was of the drop-off sort. Parental involvement was only required for the last ten minutes of the 50-minute class. My child was five and although he didn't not have a formal diagnosis yet, although we were pretty sure he had autism. I called the director and explained the situation. She told me that they had worked with autistic children before and that she was willing to try. I promised to stay outside the room in case my intervention was needed. There was only one teacher and about five kids. It was the only time we've tried something involving full inclusion outside of the special needs arena. To my surprise, he did great and needed very little help from mom. He took two more classes with Kindermusik before he aged out of Imagine That! Anyway the guitar inspired by an assignment for the Imagine That! class (3 to 5 yrs) in Kindermusik for my youngest son (not on the spectrum), who was four at the time. We were enrolled in the local Fall, 2007 class. Kindermusik is based in the United States and Canada. It's for children ages zero to about seven. 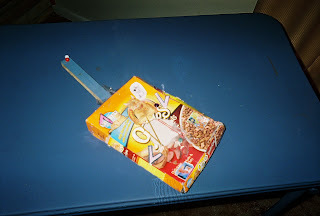 For one of the classes my son was supposed to bring a homemade instrument. I was hoping my child would want something easy like a shaker or a drum. Those are easy to make. For a shaker one can put beans, rice, marbles, or pasta in a soup can or other container and then tape the lid back on. For a drum all one needs is an oatmeal box, coffee can or other cylinder-shaped container with a lid. Decorations are optional. Anyway, my child requested what is probably the most challenging instrument to make. He wanted a "retair" (we're still working on the proper pronunciation). The bad news? I waited until two-hours before class to work on the assignment. The good news? I'm an avid recycler/semi-reformed pack rat who had a lot of stuff in the office and basement to work with. Somehow I managed to find everything finish the assignment and get the kid to class in an acceptable amount of time. The hardest part was getting the rubber bands to stay in place. Paper clips work the best, although as you can see "the guitar strings" tend to go out of line a bit. Thumb tacks and tape did not work at all. I was unable to work out a quick solution to hook up the strings from top and bottom. Was lucky to get them to stay across the hole I had cut out. My little one can get a twang out of the rubber band and is quite happy with this creation. However, if anyone has a solution to this small problem, please let me know. The rectangular 9Lives box worked great because it's colorful and has more then twenty pictures of cats. Most kids, including those on the spectrum, seem to love or relate to animals. My dream is to have both boys participate in a band someday. A Mt. Pleasant music studio which sponsors the Kindermusik program also has a rock and roll band program for older kids. I hope that someday they both can participate. Although I don't necessarily expect them to become part of a band as big as say, KISS, I do hope that music becomes an important part of their lives. Note: Although, I "designed" my guitar before I knew about this fellow, today's post is dedicated to John Elder Robison. He is an "Aspergian" who wrote the fantastic memoir Look Me in the Eye and maintains a blog that (in part) tracks his publicity efforts for his book. J.E.R. has inspired me to hope that my son will be successful upon adulthood. Mr. Robison also engineered guitars for KISS back when the band first became famous. His designs (one shot out rockets! )are much cooler than the one pictured on this blog. Sounds like lots of fun. We are always picking up instruments we find that Maizie enjoys. She loves her lap harp the most. Problem is it goes out of tune easy and we always have to ask our neighbor to tune it for us. Being in a band would be lots of fun. We have friends who have done Kindermusik. We were never able to do that but it sure looked like fun. I remember making guitars like that too, when I was small. But I'll tell you something else. . . they were frustrating, because they didn't play. The problem with a rubber band guitar is that you can't tune it or go beyond the boing-boing picking of a string. You need strings that hold tension, and some means to tighten them, to make a really playable string instrument. It's possible to make that at home, but it's a bit harder. You can find small string instruments - banjos and ukes - at tag sales for $5 at times. Your kids might really like something like that, and it could do a whole lot more. To Marla: My guy on the spectrum likes his lap harp too. Stringed instruments seem to be his favorites. Thanks, kids do inspire their moms sometimes don't they?